The Church and lands belonged to the monks of Newbattle from the early fourteenth century until the Reformation. A church at Heriot was consecrated by Bishop de Berneham in March 1244, but it is not certain whether this church lay on the same site as the present one. There is reference to a mediaeval old kirk of “Heryeth” which dates back to before 1518, and is mentioned in Reformation documents in 1627 as being in the “airis” of the house of Borthwick. By 1795, the church was in need of repair and was rebuilt in 1804. The walls were raised and a new roof built in 1836. Forty years later and on the same site, the present church was built. It incorporates one of the thick walls of its predecessor; no other remains of the former building still exist, but much of the stone of the former church was used in this building. 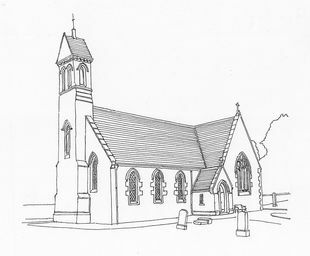 During the interim period, public worship was held in the School, and on 13 June 1875, the new (and present) church was opened by Rev TBW Niven, Minister of Linlithgow. At one time, the church bell hung on a tree near the church gates; this was said to have blown down in 1855, whence the two “Bell tree plates” which are situated at the front of the church were made. The bell itself was said to have been stolen and dropped in Heriot Water, No one was able to lift it out as “the devil had ahold of the clapper” and it is said to lie in the bell Wood between Borthwick Hall and Carcant. One old tradition which remains is the taking of the weekly offering by means of a “Ladle”. Those in use date back to 1857 and were made from the wood of the ancient tree on which, until it was blown down, the church bell hung. One old ladle, dated 1892, hangs on one side of the pulpit, and on the other side is the old hour-glass in its iron frame; this was used to stop the Minister from over-preaching and is said to be one of only two remaining in Scotland. Open daily by arrangement. Contact session clerk on 01578 760 241 to arrange opening.